Responsible food sourcing is a hot-button issue for families, institutions and the culture at large—and it’s a point of concern for many incoming freshmen at colleges and universities across the country. Fifty-three percent of Generation Z students (those born in the mid-1990s or later) say they would be most likely to go to a restaurant that uses sustainable foods, according to Technomic. And 74 percent of Gen Z students are more likely to purchase locally sourced food, while only 46 percent of Millennials (those reaching adulthood around the year 2000) made a similar statement. Many Gen Z students also have strong feelings about sustainable buildings. Today’s college freshmen are looking for campuses that are committed to energy efficiency, recycling and thoughtful stewardship of water and other natural resources. According to a survey conducted by the Princeton Review, 60 percent of respondents would choose a college at least partially based on the school’s commitment to the environment. While students care deeply about sustainability issues, they also value quality, convenience and a comfortable life on campus. Here are ways higher education institutions can promote sustainability while keeping students happy. Outdated buildings take a steady toll on operating costs. According to the APAA Thought Leaders Symposium, work orders average $2.35 per square foot in buildings between 25 and 50 years old, while maintenance costs in buildings less than 10 years old average $1.40 per square foot. 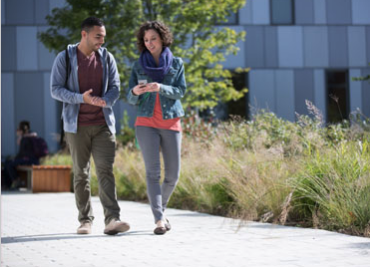 Updating campus facilities is the best way to save in the long run, but if the budget doesn’t allow for renovations, data analytics provides another way to make a sustainable difference. Business analytics can streamline the evaluation process and suggest possible changes to increase sustainability in energy efficiency, water savings and other areas. Once systems are integrated, analysts can generate a big-picture report of campus operations, showing decision-makers where money is being spent and suggesting areas for improvement. Responsible sourcing is a great place to start when transforming your institution’s food service offerings. Commit to purchasing food from local farms wherever possible, and search out organic options. Be sure to label local, organic food in dining areas to boost student awareness. For campuses looking for high-tech help with establishing local and regional supply chains, Aramark offers a partnership with FarmLogix. The organization helps schools like American University incorporate small-farm products such as produce, meats, cheese and specialty items into current distribution networks. FarmLogix uses proprietary, patent-pending technology to farm identify at the time of order and by line-item, which allows schools to promote local, regional and organic food in dining areas to boost student awareness. The system also tracks miles from farm to location using GPS technology. This advanced traceability allows for aggregate reporting of sustainable purchasing by farm, product, spend and miles traveled, even within a multi-cafeteria and multi-distributor environment. Choosing to purchase from local farmers not only caters to Gen Z students’ preferences, it also supports the local economy. Boston University is dedicated to agricultural practices that are ecologically sound, socially responsible and economically viable with its purchasing strategies. In 2014, the school committed to purchase 20 percent of its food from sustainable sources. That goal was met three years ahead of schedule! In the past year, 22 percent of the institution’s food and beverage purchases met AASHE STARS sustainable food criteria. Managing food waste is another concern for institutions pursuing sustainability. Starting a composting program, providing reusable mugs and to-go containers, and making recycle bins available and easy to access are all great ways to reduce food-related waste. But some schools are taking source reduction to the max. It attained these goals by implementing several strategies, including highly visible tactics such as trayless dining, “Weigh the Waste” events and options for smaller portions and samples. In the back of the house, color-coded and labeled bins were provided so staff could easily put waste in the appropriate place, batch preparation was initiated and the use of anaerobic digestion was incorporated. These efforts won UC Irvine the EPA Food Recovery Challenge Source Reduction Award in 2014 and Sierra’s Club #1 Cool School award in 2014 and 2015. American School & University recognized the Blue Cleaning Program at Northwestern with a Green Cleaning Honorable Mention Award in 2015. While a majority of Gen Z students are somewhat aware of sustainability issues, there is still plenty of room for education while they’re on campus. The university uses this building to consistently educate diners on the building and sourcing elements to show how it is truly a living, learning environment for sustainability. To promote an atmosphere of environmental consciousness on your campus, turn small areas of campus buildings into learning centers where students can come to grips with the amount of natural resources they use each day. Solar panels and other visible marks of sustainable energy naturally draw attention, but what about the hidden workings of a plumbing system? Revealing mechanical or pipe systems that are usually concealed is an effective way to educate students and visitors about the sustainable decisions you are making. Include placards to explain the systems and the water, energy and cost savings associated with each one. Turning your institution into a fully sustainable campus can be an overwhelming venture, but even small changes can a make big difference in the minds of Gen Z students—and to the health of our planet. As National Senior Manager for Environmental Sustainability, Rita Alison elevates Aramark Higher Education’s environmental commitments while assisting accounts in developing unique sustainable solutions. She is presently responsible for strategic and tactical development, oversight of program implementation, training and the continual improvement of the sustainability and environmental stewardship platform.